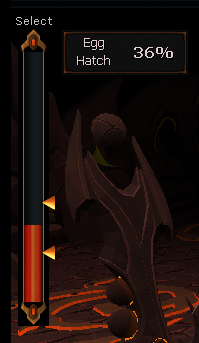 Normally, TzHaar eggs are hatched with the memories of their ancestors. But when the eggs begin hatching into Ga'al -- TzHaar without these required memories -- your help is requested by the TzHaar-Mej. Can you solve the mystery here? 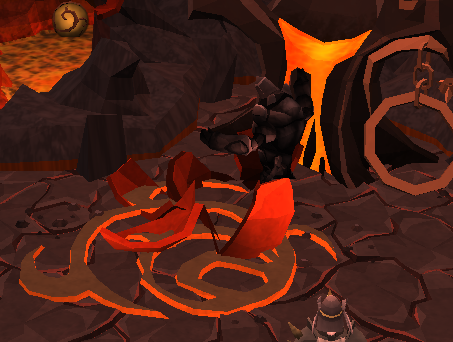 Travel with a Ga'al into the TzHaar volcano to retrieve his missing memories and learn the secrets behind the TzHaar race. 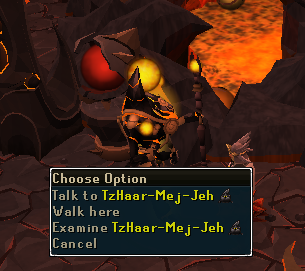 Speak to TzHarr-Mej-Jeh at the TzHaar Birthing Pool. You can start by speaking to Tzharr-Mej-Jeh in Northern Tzharr city. He will tell you that his egg is dying because it is growing cold. Mej-Jeh states that most believe it is too late to save the egg, but he disagrees, saying that the egg will grow up to be a strong TzHaar. He will ask you for your help and you accept. 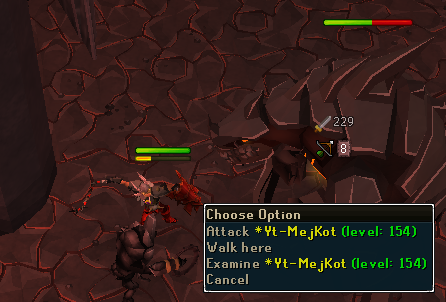 A nearby TzHaar, TzHaar-Mej-Ak also agrees to help. You and the two other TzHaar will now attempt to regulate the temperature of the egg. To warm the egg, cast fire spells at it. To cool the egg down, cast water spells. The temperature of the egg must be between two pointers on the temperature gauge. This can be a very annoying process. The pointers on the gauge will occasionally move, forcing you to heat or cool the egg to stay within the new range. Eventually when you get the egg to a pretty high hatch percentage it will hatch. Quest Complete! Nah just kidding. The egg will hatch and be of the Ga'al caste, a caste which has no memory of its ancestors and has a reputation for being lazy and lawless. Mej-Jeh is upset by this as he thought the egg would hatch into a strong TzHaar. Unfortunately he cannot lay another egg, and has nobody to pass his memories onto. 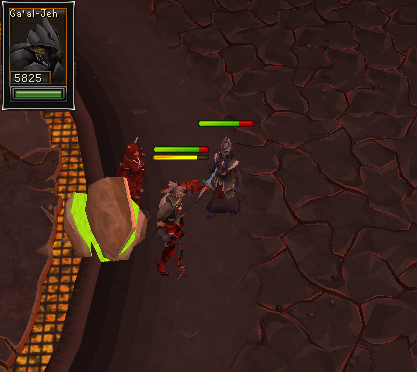 The Ga'al is taken away by TzHaar-Mej-Ak and Mej-Jeh tells you he will likely die in the fight pits. Mej-Jeh says that more and more eggs are being born Ga'al instead of TzHaar and he may be able to fix the problem by giving memories to the Ga'al. He says you will need to retrieve his Ga'al from TzHaar-Mej-Ak and bring him to the library west of the main plaza. Head west and you should see many players gathering for the fight pits. Talk to TzHaar-Mej-Ak and tell him you want the Ga'al back. He will refuse to give it back and tells you the only way you can retrieve it is to protect it in the fight pits. You will have to do this. 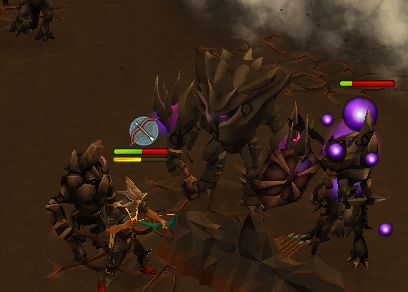 Gather any combat gear you have and agree to join the fight pits. 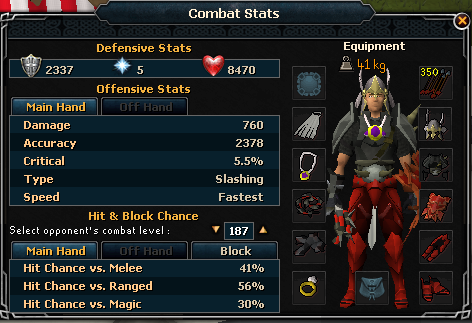 It would be useful to get different types of combat gear because you will need to fight players of varying classes. To protect the Ga'al attack any player or Tzharr that attacks the Ga'al-Jeh. You should see the health of the Ga'al in the upper left part of your screen. The players are around level 130 and the TzHaar are around level 140. After killing all of the players and TzHaar, TzHaar-Mej-Jeh will appear and tell TzHaar-Mej-Ak to give him the Ga'al so he can transfer memories. 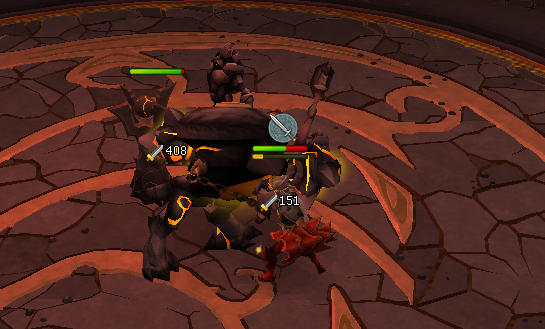 At this time TzHaar-Mej-Ak will summon the champion, the level 150 TzHaar-Ket-Yit'tal. Ket-Yit'tal will kill the Ga'al-Jeh. 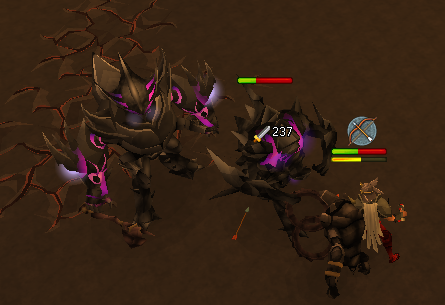 Following this, TzHaar-Mej-Ak will leave you to fight the champion. The champion will attack with melee, so if possible turn on protect from melee. 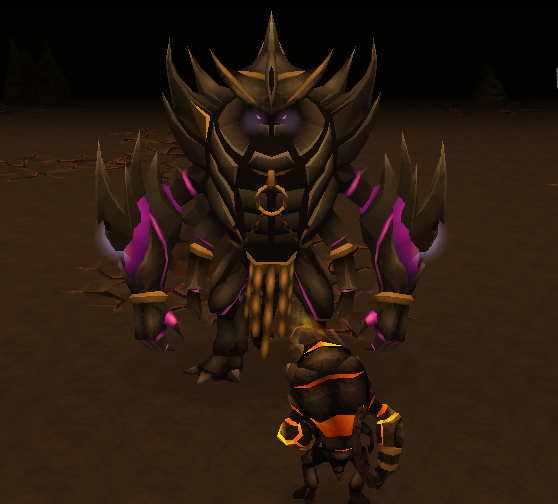 He has a very high defence level, and combined with the fact that he has no listed weaknesses killing him may take some time Once you kill him Mej-Ak will be upset and tell you that like Mej-Jeh the champion has no TzHaar to leave his memories to. He will blame you and Mej-Jeh for this. However, Mej-Jeh, who always has a trick up his sleeve, knows a way to get the champion back. He says he has found a way to retrieve memories from TokKul, the currency of the TzHaar which is made of up dead TzHaar. He says by using the Elder Kiln the TokKul can be fused with an empty body (the Ga'al) to create a TzHaar. 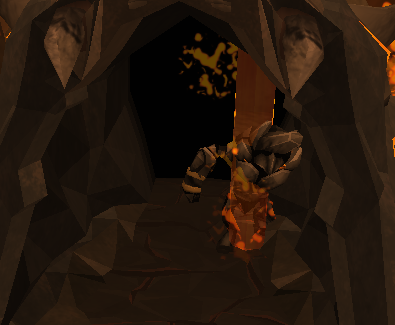 Mej-Jeh also states that TzHaar are forbidden from entering the Kiln, but a human like yourself could enter it. 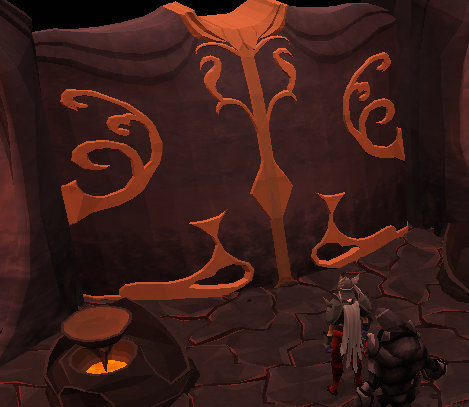 Mej-Ak will agree that this may be the only hope of the TzHaar civilization and lets you go to the Elder Kiln. Now it is time for the tough combat part of the quest. Head east to the bank and minigame sign on the minimap and you should see a cave. Be sure you have a rune pickaxe or better and enter the cave. After entering the cave you will meet up again with the Ga'al. To get to the Kiln you will need to jump over a chasm. The Ga'al is a bit intimidated and at first refuses to go. Keep on encouraging the Ga'al and he will jump the chasm. After jumping the chasm you will be left to kill three level 148 lava monsters and a level 100 Totz-Ket-Dill. The three lava monsters attack with magic so range would be the best option for killing them. There will also be a Totz-Ket-Dill. The Totz-Ket-Dill has a hard shell and a powerful special attack. 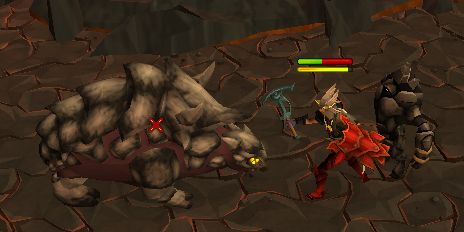 You will need to wield a rune pickaxe to break his hard shell. After a couple of swings you will break his shell and be able to kill him however you want. Once you have killed all of the monsters, go to the cave entrance to the north and investigate the skeleton nearby. Pick up his journal and read it, along with the note. The journal will show a researcher's failed attempt to discover the kiln and the note will have TzHaar numbers on it. Next you will need to fight another wave of monsters in another room. If you need to bank you can go back outside and bank at one of the guards near the entrance of the tunnel. This will not cause you to lose your progress. Now head through the tunnel. You will find some TzHaar ring weapons which you and the Ga'al will pick up. Head north and you will find more lava monsters and two level 156 Ket-Zek. The lava monsters and the Ket-Zek will attack with magic, so again use range to kill them. Once you have killed the monsters in this room go north and enter through the tunnel. You will find (you guessed it) more monsters! This cave will have four lava monsters and a level 100 Totz-Ket-Dill. Kill these monsters as you did in the previous room, and continue. Finally you will find a large, ancient gate. To open the gate you will have to play around with the scales. Operating the scales nearby the gate should give you this menu. 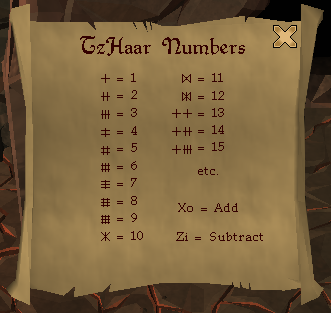 You should see a simple math equation written in TzHaar language. You will have to place the right amount of TokKul on both scales. The scales are different for every player. Use the note in the journal (which can be seen a few images above) to help you figure out how much TokKul must be placed. If you place the wrong amount of Tokkul you will be hit with 300 damage. After placing the right amount of TokKul on both of the scales head through the gate. The next room will have five chasms to jump over and one level 100 Totz-Ket-Dill. The room after that will have three lava monsters and a level 154 Yt-MejKot, which attacks with melee. 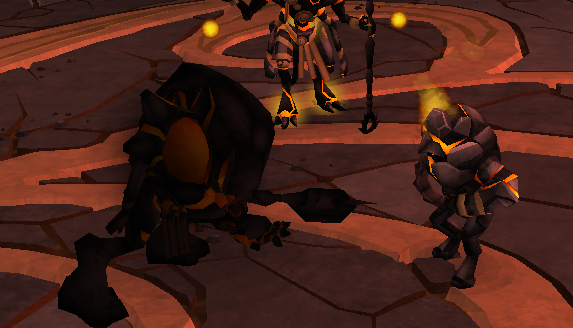 You should try to kill the lava monsters first by getting the Yt-MejKot stuck behind the lava monsters and killing them. After you do that move onto the Yt-MejKot. The Yt-MejKot has a a special healing ability, so try to knock it out by using threshold and ultimate abilities. The Yt-MejKot is weakest to water spells. It is also possible to safespot the Yt-MejKot if you find it necessary. After you kill all of the monsters in this room you will be at the entrance of the kiln. When you get inside the kiln you will be greeted by a lava creature who will tell you that your skills are about to be tested. If you think the skills he is talking about are crafting and herblore you are wrong. You will need to face seven waves of monsters which get harder and harder with every wave that passes. All seven waves must be killed at once so you cannot access a bank in between waves. 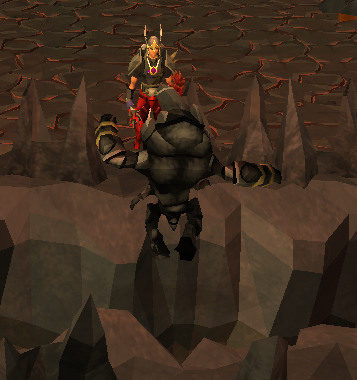 It is similar to the fight caves for those who have attempted that. This is going to be pretty tough, so you will have to prepare for this. Bring gear for two different combat classes so you can exploit most weaknesses. 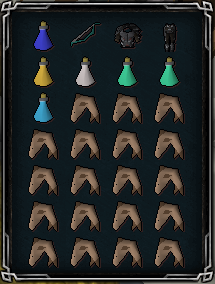 In the above two pictures ranged equipment is in the inventory and melee equipment worn. It is recommended that you bring prayer potions and combat potions. In the example above the user has chosen super offensive and defensive potions. If you feel more comfortable you may want to downgrade to regular potions. Bring decent food, preferably sharks or better. You cannot bring any type of familiar into the caves. The key to this should be divide and conquer. Each monster spawns at different parts of the kiln. Do not run into the center of the kiln in the fight. Stick to one corner and try your best to fight each monster one at a time. This will be tough to do of course but there will still be methods to fight one on one if you happen to run into two at once. One of these methods is to get the melee monster stuck behind a maging or ranging one as seen below. 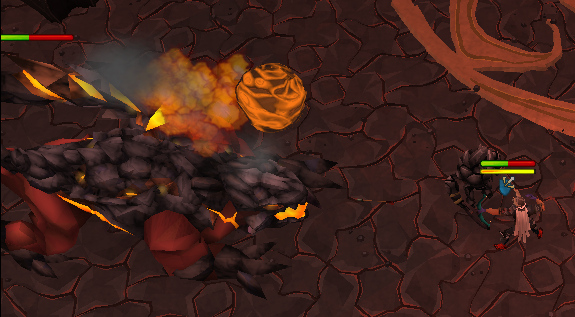 There are also a variety of safespots around the kiln that can be used to block or attack over the melee monsters. The maging monsters will be weak to bolts and all melee monsters will be weak to water spells. You will be fighting monsters called TokHaar. 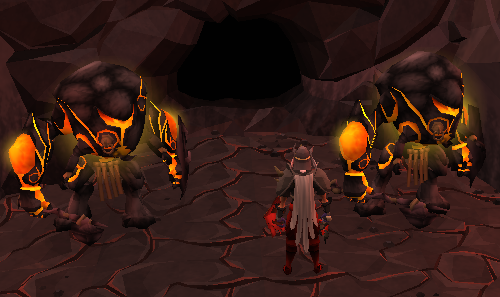 They are look similar to the TzHaar but will be referenced as TokHaar below. Don't get confused! Wave 1: This wave will have two level 100 TokHaar-Hur which attack with melee and a level 140 TokHaar-Xil which attacks with range. Try to kill the two melee TokHaar first or get them stuck behind the range TokHaar and deal with them later. Wave 2: This wave will have a level 160 maging TokHaar-Mej, a level 180 melee TokHaar-Ket, and a level ranging 140 TokHaar-Xil. 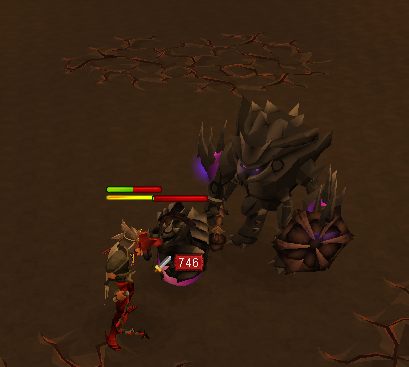 There are powerful monsters of every combat type so try your best to kill each one at a time. If this is not possible trap the melee TokHaar behind a range or mage TokHaar and deal with the TokHaar-Ket when you are done with the other two. Wave 3: The next wave will have two level 140 TokHaar-Xil and a level 160 TokHaar-Mej. There will be no melee TokHaar so this wave is pretty straightforward. As always try to deal with the monsters one at a time. Wave 4: This wave contains two level 100 meleeing TokHaar-Hur, a level 140 TokHaar-Xil, and a level 160 TokHaar Mej. Like wave two there is a TokHaar of every combat type. Unlike wave two however the melee TokHaar are weak. If necessary trap one of the melee TokHaar behind an obstacle or a monster and deal with them last. Wave 5: This level will contain one of every monster you have faced so far. If you forgot, this entails two melee TokHaar, a ranging TokHaar and a maging TokHaar. This is going to be tough so if you haven't put prayer on yet now will probably be a good time. If possible try not to deal with more than two monsters at once by trapping them. This can be tough with two melee TokHaars but it is manageable. Also, it is not necessary to deal with more than one melee TokHaar at once. You can trap either one behind the other, as shown below. Wave 6: This level will contain three level 160 TokHaar mages, a level 140 TokHaar ranger and a level 180 melee TokHaar. For convenience sake try to kill all of the mages first so you do not have to constantly change gear. Once you have finished those three you can move on to the last two. Wave 7: This is the final wave. This wave has a level 160 TokHaar mage, a level 140 TokHaar ranger, and a level 150 TokHaar champion. The TokHaar champion attacks with melee and drains prayer. Because of this try to save the champion for last so you can have prayer to fight the other TokHaar. If necessary get the champion stuck behind the other monsters. Once you have finished this wave you have completed the required fighting portion of this quest. After the fight speak with TokHaar-Hok. Ask him that you need to infuse the memories of the champion with the Ga'al in the kiln. He warns that this is a dangerous process. He will ask your opinion on risking the Ga'al's life for this. Tell him anything (even the option where you think it's a bad idea) and he will allow for the transformation to occur. Get the Champion's TokKul (if you don't already have it in your inventory) and return to the kiln. The Ga'al will head over to the kiln and the transformation will take place. According to Ga'al-Xox being TokKul is painful and crushing. 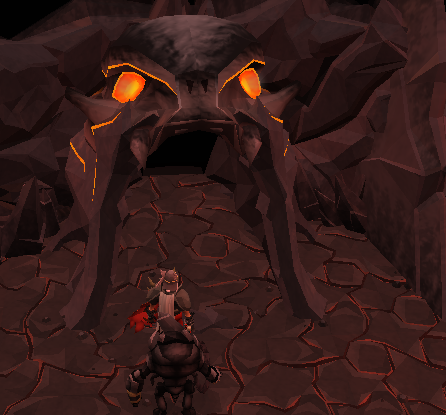 Leave the tunnels and talk to TzHaar-Mej-Jeh at the main plaza. You will tell him that you have found the kiln and that the forging has been completed. 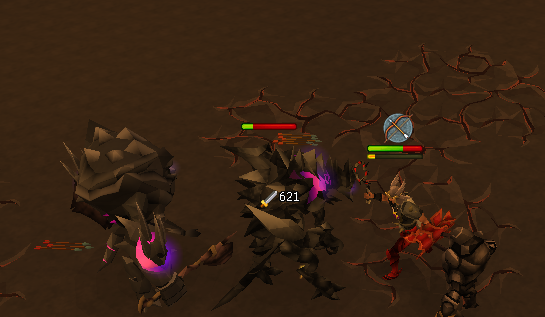 TzHaar-Mej-Ak will not be sure of the claim and will tell the Ga'al to fight a level 600 TzHaar-Ket. You will have the option of stepping in or letting them fight but both will lead to a fight. The Ga'al will kill the TzHaar. You and the Ga'al will tell the other two TzHaar the story of your journey. Even though you tell them of the extreme pain and suffering the TzHaar still want to go through with the transformations. The Ga'al will ask you for help in the argument and once again any option you pick will lead to no change of opinion in the TzHaar. The Ga'al will leave in shame and you will be left with the two TzHaar to receive your award. The quest will end with the Ga'al meeting with TokHaar-Hok over plans to stop the TzHaar. ...and if that doesn't hint at a sequel I don't know what does. 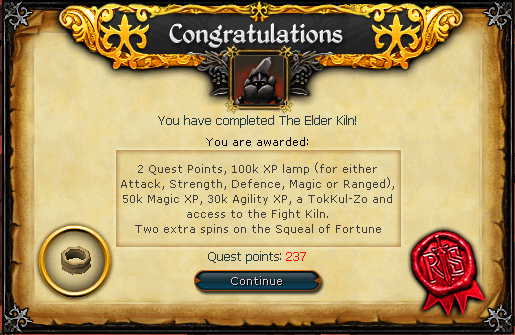 100k XP lamp for Attack, Strength, Defence, Magic, or Ranged 50k Magic XP 30k Agility XP TokKul-Zo The Fight Kiln minigame A TzHaar title. 2 Spins on the Squeal of Fortune. The TokKul-Zo is a ring that increases damage damage dealt to TzHaar when worn and can teleport its user to various places in Tzhaar city. It provides +1.5% critical damage to all combat styles and has an armour rating of 2.